Today's cookie is the Peppermint Pinwheel Cookie, spotted over at Poca Cosas blog. 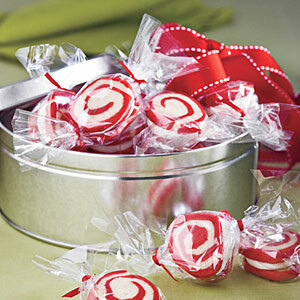 These minty treats look adorable when wrapped in cellophane like a real peppermint! 1. Beat butter at med. 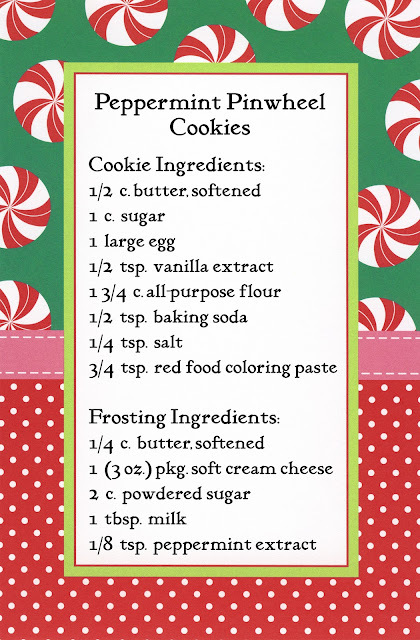 speed with a heavy-duty electric stand mixer until creamy; gradually add sugar, beating until light and fluffy. Add egg and vanilla, beating until blended, scraping bowl as needed. 6. Bake at 350° for 6-7 minutes or until puffed and set; cool cookies on baking sheets 5 minutes. Remove to wire racks, and cool completely (about 30 minutes). Beat butter and cream cheese at med. speed with an electric mixer until creamy. Gradually add powdered sugar, beating at low speed until blended. Increase speed to med., and gradually add milk and peppermint extract, beating until smooth.